Tractors and tires should be maintained to optimize tractor wheel slippage at 10% to 15%. Photo: Robert Grisso. Tire slip occurs when the tires are turning faster than the ground speed of the tractor. As a result, less than 60% to 70% of the power that a tractor engine develops is used to pull an implement through the soil. It could even drop to 50% on soft and sandy soils. Some of the power developed by a tractor engine is lost in hydraulic systems, transmissions, cab air conditioners, and other applications. However, most of the power is lost in transmitting power from the tires to the soil. It may seem as if efficiency would increase without any slip; however, that is not the case. There must be some slip between the tires and the soil surface for an efficient operation. Limited slip improves tractive efficiency, which is the ratio of drawbar power to axle power. Slip also provides a safety valve against shock overloads that could damage the power train; some wheel slippage is needed to reduce wear on the power train. However, too little slip anchors the tires to the soil because of too much ballast, so power and fuel are wasted in trying to move the tractor through the soil. A balance must be found where slip is optimized. 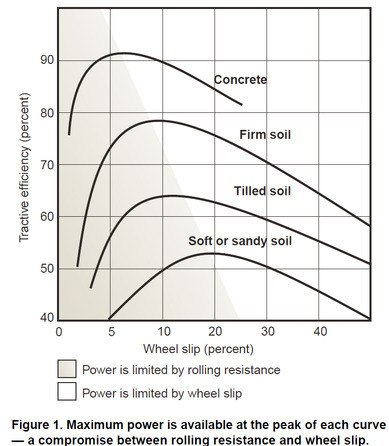 Figure 1 shows the relationship between slip and tractive efficiency for several different soil conditions. For the most efficient operation, slip should be near the peak tractive efficiency. Notice that the peak tractive efficiencies occur between 8 to 15% slip, depending on soil types and conditions. For every 1% past optimal slip, you lose an equivalent 1% in productivity and reduce your energy efficiency. 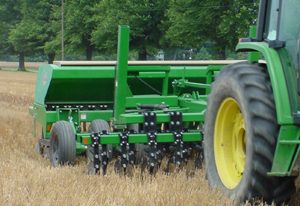 Tractors and tires should be maintained to optimize wheel slippage at 10% to 15%. Less slippage than this results in the expenditure of too much fuel energy to move the wheels, whereas too much slippage (greater than 15%) can result in excessive tire spin and energy loss through the tire, which is nonproductive. Place a mark on the inside of the tire that you can observe from the tractor seat. Flag or mark off a distance of 100 feet part way into the field. Determine the circumference of the tire by placing a string (or cloth/plastic measuring tape) around the center part of the ribs. Finally, drive the 100 feet with the field operation in progress, counting the number of revolutions of the tire. Multiply the number of revolutions by the circumference (in feet) of the tire and divide by 100. For example: Your tractor wheel circumference measures 14 feet. In plowing 100 feet, you count 7¾ rotations of the wheel. That means your tire turned 108.5 feet while traveling the field distance of 100 feet, thus 8.5% more, which represents your percent field wheel slip. purchase new tires, if they are heavily worn. If slippage is less than 10%, you should remove weights and check the tire pressure.